You are here: Home / Christian Talk / Christians Alike; How To Overcome Your Storm. 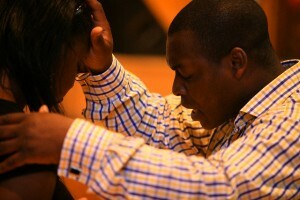 (ThyBlackMan.com) Our message is entitled, “How to Overcome Your Storm.” Our scripture is coming from the Gospel of Mark, Chapter 4. Mark 4:40 reads, “Why are you so fearful? How is it that you have no faith?” The next verse reads, “And they feared exceedingly, and said one to another, “What manner of man is this, that even the wind and the sea obey Him?” The next verse reads, “And they came over to the other side.” Look at somebody and say, “Let’s go to the other side. Turn to somebody else and say, “It’s time to go over to the other side.” I want to talk to you a little bit about how to overcome your storm. through there and shares the parable of the sower. He described three to four types of believer. One believer is what I call, “wayside.” This refers to the people who just kind of show up, don’t ever receive, don’t have any Word in him. The next type of soil is what Jesus called, “stony ground.” Then there is another group. He called them “thorny ground,” where the cares of this life choke out what has been sown into them. Then there were those, oh, that had no depth in themselves. Yeah, that’s before the stony ground and He’d say, when the sun came up, persecution came because of the Word. So, you’ve got to understand most of your attacks literally have nothing to do with you. I try to keep you convinced all the time that the enemy is coming because of the Word that’s been sown into your life. See, that is what he’s been doing since beginning of time – trying to make God like He’s a lie. And God reiterates throughout the scriptures that, “I’m not a man,” and it is obviously impossible for God to lie. So, what the devil does is he tries to make and work on the man and the believers so that the believer would think that what God said is not going to happen. Then, when you move out of the parable of the sower, He goes on into another. When He started talking about a lamp is not made to be hidden, but it’s actually made to be illuminated. Well, what He’s trying to say there is that your faith should develop so it gets so strong and bright until it just supplies whatever you need. Then, He started talking about sowing, and when He started talking about the mustard seed, you will see how most people kind of think the text deals with the size of the mustard seed. But no, it has very little to do with the size, but more with the intensity of the seed. The seed has already purposed in his heart is already made a decision that, “One day, I’m going to be a tree.” So, to see then, it doesn’t care what it has to go through. The storms, floods, hurricanes, earthquakes. You ride up and down on Airport Boulevard, and Government Street [in Mobile, Alabama]. You see old trees that are hundreds of years old. Those trees have weathered some very bad storms, every major storm that has come through Mobile. Well, what happened? It was at one point just a seed, but inside of the seed — I need you to stick with me — but inside, the seed was it telling itself all the time: “One day I’m going to be a tree.” Look at somebody and say, “One day, you’re going to be everything God said you will be!” It is okay to praise Him right there! This man of god is the pastor/teacher of Word of Life Community Church of Whistler and Chickasaw, AL. For teaching materials, please call (251) 456-2652.